"ZeroWater's 23 Cup Water Filtration Dispenser is great for in home or small office usage. The sleek design includes a one-hand, push and pour spout that allows you to dispense water into your cup or favorite water bottle without any lifting. The 5-stage filter transforms your tap water into delicious, TDS-free drinking water. All ZeroWater products include a free Water Quality Meter to test your water to ensure the highest quality filtration on the market. Get more out of your water with ZeroWater's 5- Stage Water Filtration. 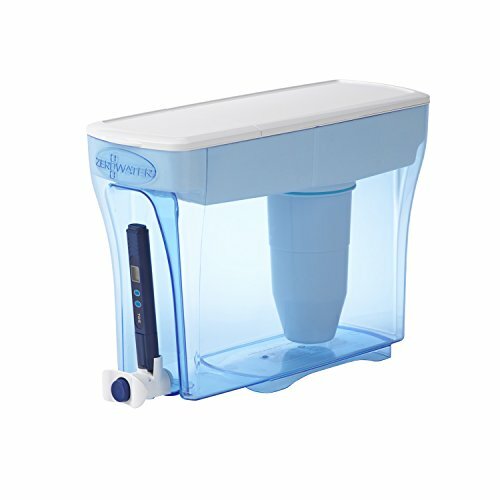 ZeroWater customer service has this statement for draining complaints: To alleviate this it is best to lift the filter and reservoir out of the pitcher or dispenser and tap the side of the filter using moderate force to help break up the air pocket. Then take just the filter & reservoir to the sink and put about an inch of water into the reservoir and allow that to run through the filter and right into the sink to displace and dispel the air pocket. After that has completed then return the filter and reservoir to the pitcher or dispenser and continue to filter water as normal.